When it comes to value for money, several of the big brands stepped up to the plate this year with updated entry-level and mid-price models bristling with features that have trickled down from their premium-priced instruments. 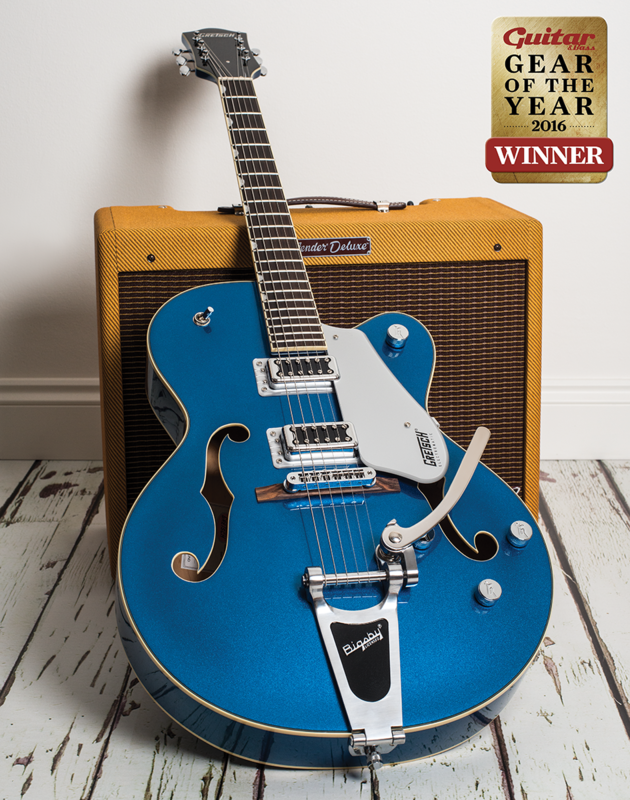 Gretsch is conspicuous for having two guitars shortlisted, but it was impossible to resist as the company revamped its Electromatic line and created a whole new, ludicrously affordable and highly modifiable range in the shape of the Streamliner series. 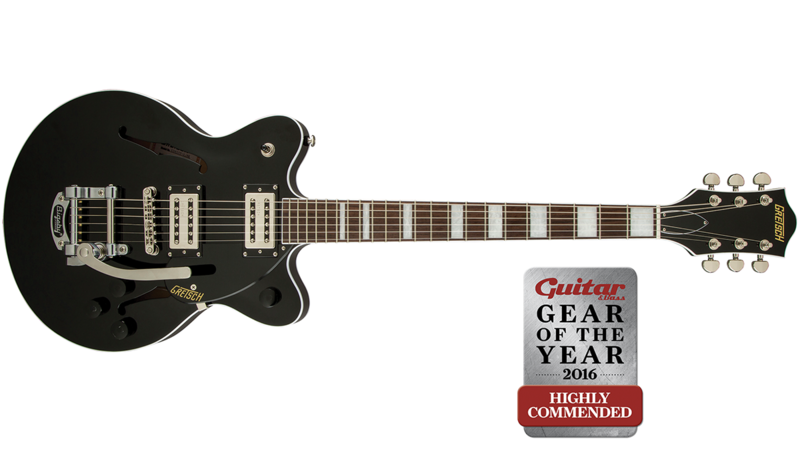 After Gretsch wowed us with its brilliant entry-level Streamliner series earlier this year, the only way was up for the revamped mid-priced Electromatic line, and what a guitar this fully-hollow G5420T is. The build quality impressed us enormously for a guitar in this price bracket, delivering old-school Gretsch aesthetics and silky modern playability. The Blacktop Filter’Trons sound just as those pickups should – providing that undeniable whiff of twangy authenticity, but with a little added bark and grit. It’s a serious Gretsch at an affordable price, which also provides oodles of customisation potential. There’s never been a better time to buy a new Gretsch, and this Fairlane Blue beauty stole the hearts of everyone at G&B in 2016. 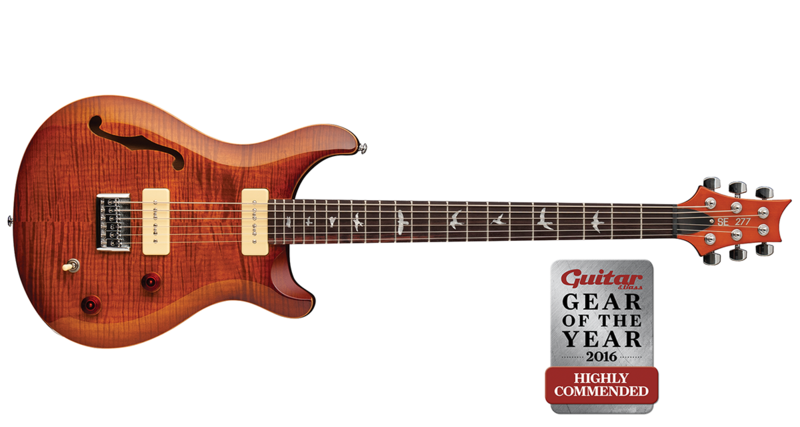 Far from being just for metalheads, this affordable baritone from PRS proved it was no one-trick pony when it arrived in the G&B office last winter. With the Korean-made SE Mushok model having run its course, Doug Shive, the head honcho of PRS’s SE division, decided that it was time for an update to bring the brand’s baritone offering into line with the rest of the SE stable. The level of fit and finish here is extraordinarily good for the money, and the Wide Fat neck shape makes this an easy, stable player with carefully chosen PRS SE Soapbar pickups. The bite of P-90s, combined with a little additional air from the semi-solid construction, add up to what is a hugely versatile proposition for everything from retro twang to modern alt-rock. Increasing numbers of hip modern-day experimentalists and indie noiseniks turned to Fender’s less mainstream designs for inspiration in 2016, with the likes of the Jaguar, Jazzmaster and Mustang enjoying a second renaissance. It was a smart move, therefore, when Fender launched a slew of cool new models at made-in-Mexico prices at the tail end of 2016. The Duo-Sonic HS was our pick of the bunch. 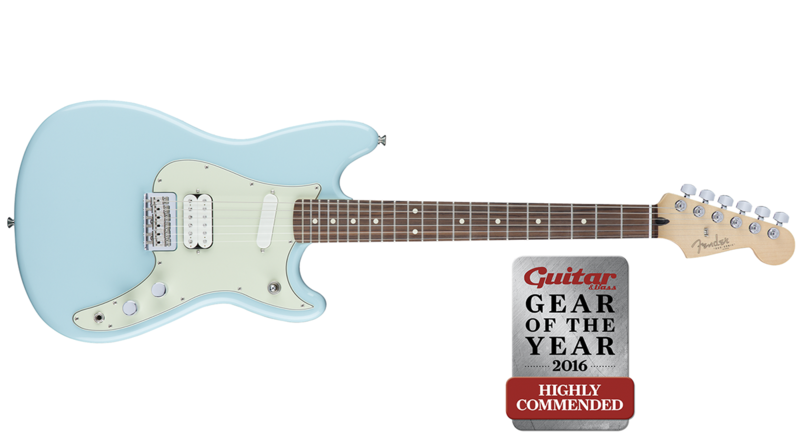 Its cool-looking body shape mirrors the model’s original 1956 outline, the build quality is great for the price, it delivers a wide range of brash sounds from its Duo-Sonic humbucking and single-coil pickups and old-school fans of the Seattle sound will absolutely love it. It’s more robust than vintage examples, too. A whole lot of guitar for the money. Revealed at Summer NAMM in Nashville, the Deluxe Strat HSS is part of a new-for-2016, Mexican-made Deluxe range, a sort of ‘little brother’ to Fender’s high-end American Elite Series – but it certainly doesn’t feel like a low-spec option. With Vintage Noiseless single-coil pickups, a modern bridge, locking tuners with vintage-style buttons, 12-inch fingerboard radii, ‘Tall Narrow’ frets, contoured heel, ‘enhanced’ electronics, and pearloid dots, it’s a full feature set for the price. We were impressed by the HSS’ versatile range of single-coil and humbucking tones, too. All in all, it’s an excellent contemporary Stratocaster for the gigging player who needs to cover a variety of bases. “A real Gretsch for less than £400?” asked the cover line of our March issue, somewhat incredulously, following the release of Gretsch’s updated pocket-money Streamliner Collection. And, yes, it was true. 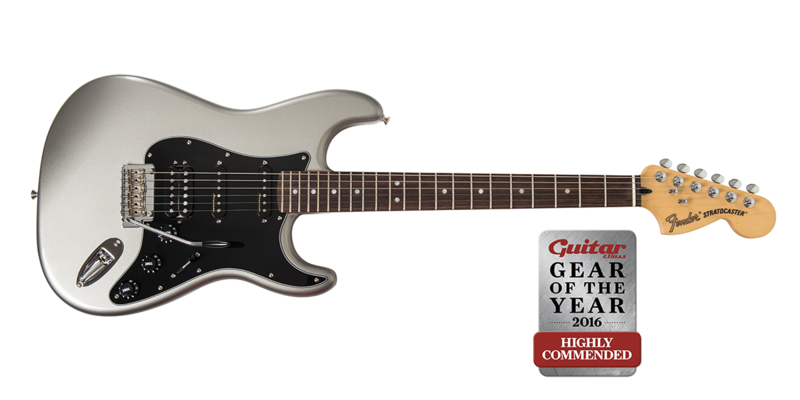 In fact, any of the three guitars we reviewed from the series could have made our Gear Of The Year shortlist, but it was the G2655T that stood out. Its stylish classic Gretsch double-cut outline, pair of Broad’Tron pickups that sit somewhere between a Filter’Tron and PAF-style humbucker, B50 Bigsby, easy playability and versatile range of tones had us checking the price tag twice and then reaching for our wallets. When you factor in the potential for modding, too, it’s a price too good to ignore.